Heaven is chocolate and peanut butter flavoured. In times like this, feedback is what keeps the kitchen going. We can always turn to “the Box”. The Box contains all our notes and cards from the past four years. We have purchased cards, hand made cards (sometimes lavishly illustrated) and simple (or elaborate) letters. Some are addressed to “chefs” or “cooks” or “kitchen angels”. Sometimes people have taken the time to learn some of our names or all of our names. Sometimes people have taken the time to mis-spell our names. The communications are as different as the variety of people who come here but they all say “thank you” and they all feed our souls. This gratitude makes it reasonable, possible, necessary to ensure the soup tastes just right, to garnish a platter, to cook a gluten and dairy-free dessert for one person out of forty, to come in early to cut chive blossoms, research pithy sayings for the menu boards or to post a requested recipe on the blog. We get other communications as well. We’ve had smiles and hugs and furtive “thank you”s in the hallway from retreatants greatly daring to break silence. We’ve been applauded and sung to … in French, no less! Sometimes comments are funny … “Even if I lost my faith, I’d come back for the food.” Sometimes they are heart-rending – like the man who told Kate that the meals were so good that they made him cry. What do you do with a compliment like that?!? The only possible answer is to let it inspire you and strive to be worthy of it. And so, Pat v. V., this recipe is for you. Thank you for your kind words and thank you for knowing about our little blog! Press into a parchment lined, 9 x 13 inch pan. Dashing off to the kitchen now… thank you for reading and thank you for all your thank yous! I love my job. It’s not “just a job” that I have to drag myself to each day. I love creating meals. I love that we emphasize simple, comforting, and healthy food at Loyola House. I love that we nourish and positively impact so many people with our creations from the kitchen. There is a unique relationship between cook and guest, that is difficult for me to articulate, this is maybe draft number 7, but I will try. I put my passion, love, and prayers into the food I create for you. And you trust my skills as a cook and eat what I’ve created. We may never speak to each other, but a bond is created nevertheless. I care about you as a guest at Loyola House, whether you’re here for a season or an afternoon. On the Ignatius Jesuit Centre property in Guelph, where Loyola House is located, there is also a Jesuit cemetery. Jesuits who die in this area are buried on the property. After the burial, friends and family come to Loyola House to sit and mourn or celebrate the life of their loved one, and we provide coffee and cookies. So often I want to offer a hug, but I am shy, and they are strangers, so instead I put the hug into the food and hope it translates. And so, with that lengthy preamble, comes the news that there will be the funeral and then the burial for Jim Webb, previous Provincial of the Jesuits of English Canada, this afternoon. I did not know Jim well, but I am saddened by his death. When I first heard he had died, my instinct was to bake. 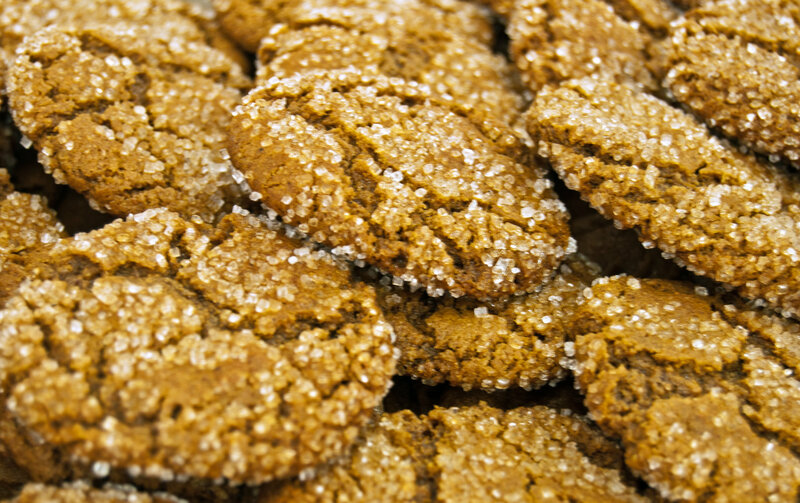 My favourite cookies are our Molasses Cookies. I don’t even have to try to imbue them with hugs. Comfort is released with every bite. It’s a wonderful dough that can be made ahead of time and left in the fridge until fresh cookies are desired. For a chewy texture, they only need 12 minutes in a 350 F oven. Eat them slowly to savour the orange flavour – they are excellent! Let dough sit for at least half an hour so it is not sticky. (If it is sticky, stir in a little more flour). Roll into small balls and roll balls in coarse sugar. These cookies are designed to rise and then fall, giving them their distinctive crinkled surface. Fennel is a vegetable I only began eating in the past couple of years. And now that I know about it’s mildly licorice flavour, I am making up for lost time. 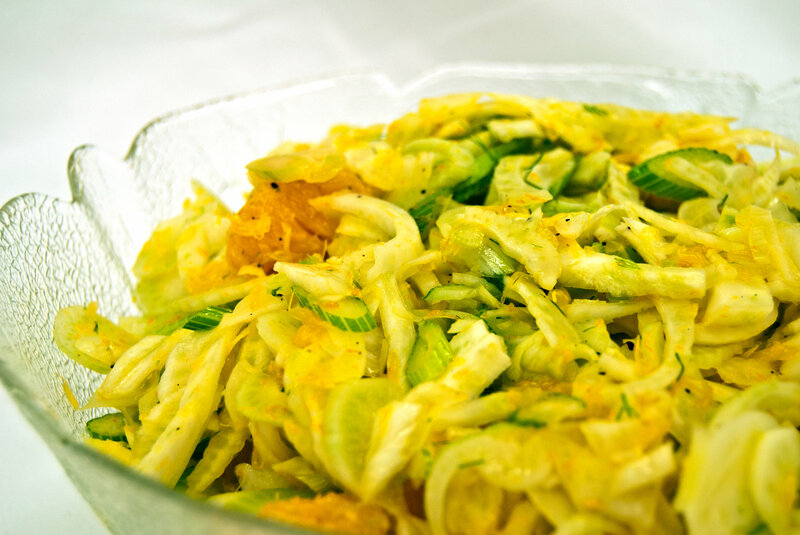 Making fennel salad is also a good way to practice and hone one’s knife skills. I think fennel is best when thinly sliced – almost shaved – so give yourself some extra prep time to put those skills to use. The oranges need to be zested, peeled, and segmented with care so as to remove all the white pith and membranes. This takes a while as well, so while this isn’t a salad to make when strapped for time, it is well worth the effort. To prep the fennel, cut off the fronds (the dark green, feathery leaves). Some of the younger and finer fronds can be used as a garnish, but generally I find them to be bitter and with an unpleasant texture, so use sparingly. Trim the stems, cut the bulb in half, and remove the core with a paring knife. The acid in the vinaigrette is lime juice, along with the orange zest. Whisk this together with honey, mustard, salt and pepper, and then slowly add the oil. (See my Cucumber Watermelon Salad post for vinaigrette ratio information). Thinly slice the fennel and some celery. Segment the oranges, and mix everything together. Enjoy! It has been a busy week here at the Loyola House Kitchen, and I have finally found a few moments to post one of my favourite dessert recipes. Still on the to-do list is to photograph the pre-butterflies, which will have to wait for tomorrow as the evening light is quickly coming to a close. We had a very successful Ignatius Day dinner Tuesday night. Susan ordered local, well treated chicken and pork ribs, and worked her culinary genius to create one of the best meals I have ever eaten. To be a part of the magic is an honour indeed. A quick 24 hours later brought a new group of retreatants, and we are back into the busy swing of things! Mix dry ingredients and cut in butter until crumbly. Press ½ of the mix firmly into the greased pans. 9 c chopped dates – look at them closely and remove any pits! Simmer until dates are soft and liquid is absorbed. Spread over bottom crumb layer. Sprinkle remaining crumb mixture over top. 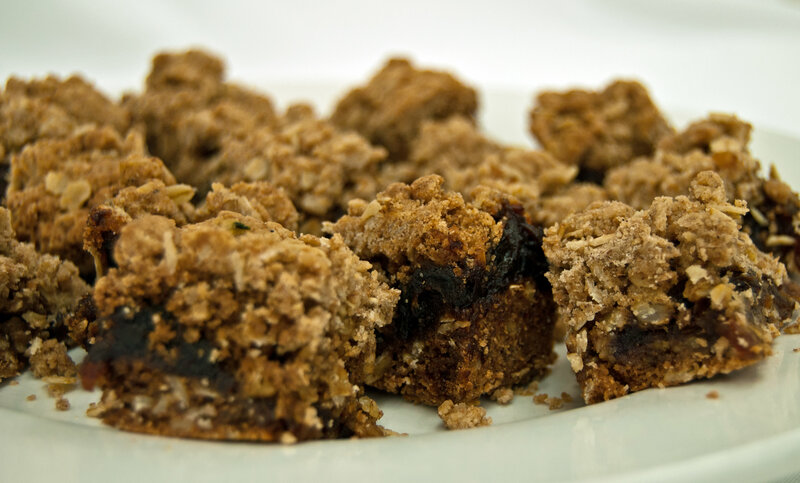 You want to achieve full coverage of dates and to make sure all the crumbs are anchored in the filling whilst maintaining as much fluffiness in the top layer as possible. Bake at 350 for 30 minutes or longer until a nice golden brown colour. Chill (covered) overnight before cutting.